Another golden day for the Windows Insiders, when we got the second build for the day! The first build (17735) was for the Windows Insiders in the Fast Ring, whereas the second build (18214) is for the Windows Insiders who opted for Skip Ahead. Here's what's new and improved in latest Windows 10 preview build for the Windows Insiders in the Skip Ahead. Don't forget to checkout the known issues. 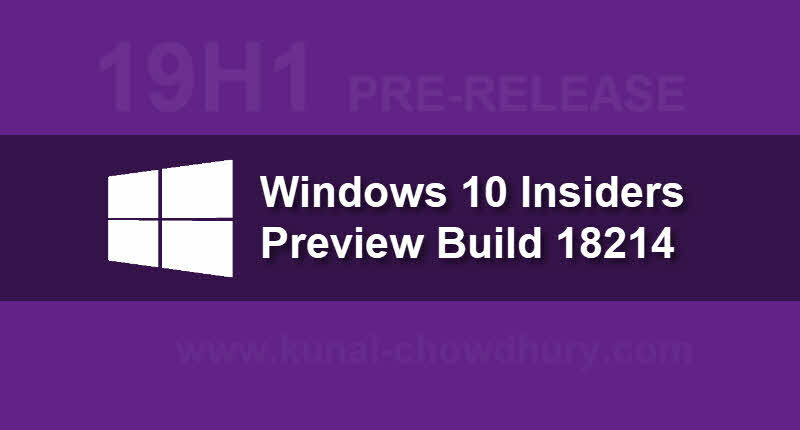 Microsoft released Windows 10 preview build 18214 for PC to the Windows Insiders in the Skip Ahead. This build is a pre-release version from the 19H1 development branch and contains few new changes and a bunch of fixes to the issues. Those who are in Fast Ring, already aware of the new changes as these were aired with build 17730. What's new and improved in latest Windows 10 insiders build 18214? The Your Phone app is now live for Insiders who are in Skip Ahead running 19H1 builds. If you are an Android phone user, you can now drag and drop photos from your phone onto your PC. You can now copy, edit, or ink on that photo, right from your PC. Improved security on Microsoft Edge browsers by guaranteeing HTTP/2 preferred cipher suites. Improved performance on Windows 10 thanks to Cubic, the new default TCP congestion provider. Fixed the issue resulting in the Clock and Calendar flyout sometimes not appearing until you clicked Start or the Action Center. This same issue impacted both notifications and the taskbar jump lists appearing. Fixed an issue where Timeline's scrollbar didn't work with touch. As some keen eye'd Insiders noticed, Microsoft is working on scaling logic and you should find apps resize better now after monitor DPI changes. Microsoft updated the messaging in the Snipping Tool to more closely align with the commitment made here. What are the known issues in Windows 10 Build 18214? When you upgrade to this build you'll find that the taskbar flyouts (network, volume, etc) no longer have an acrylic background. On Windows 10 in S Mode, launching Office in the Store may fail to launch with an error about a .dll not being designed to run on Windows. The error message is that a .dll "is either not designed to run on Windows or it contains an error. Try installing the program again...". Some people have been able to work around this by uninstalling and reinstalling Office from the Store. If that doesn't work, you can try to install a version of Office not from the Store. There is a known issue in Narrato's automatic dialog reading where the title of the dialog is being spoken more than once. If you have come this far, it means that you liked what you are reading (Here's what's new, improved and still broken in latest Windows 10 preview build 18214 for Skip Ahead (19H1)).